Sulfuric acid, also known as sulphuric acid, is a strong acid. It is also a chemical compound. Its chemical formula is H2SO4. It was known as "Oil of Vitriol" in ancient times. It is a dense (thick), clear, corrosive liquid that can dissolve in water. It can also melt through some weak substances. It was once known as "oil of vitriol". This name was created by Jabir ibn Hayyan, the person who discovered it. It used to be prepared by the reaction of potassium nitrate with sulfur. This reaction would produce sulfur trioxide which would dissolve in steam to produce sulfuric acid. Then this reaction was done in lead containers. The contact process, the most common process, was invented in 1831 and is still used today. It is made by reacting sulfur trioxide with sulfuric acid to produce oleum. Then oleum is dissolved in water to produce more sulfuric acid. The sulfur trioxide is produced by burning sulfur to produce sulfur dioxide, which was then oxidized to sulfur trioxide with a catalyst. This process is called the contact process. Sulfuric acid has many uses. World production in 2001 was 165 million tons, worth about $8 billion US dollars. Uses include ore processing, fertilizer manufacturing, oil refining, wastewater processing, lead acid batteries, and combining chemicals for scientific reasons. For example, phosphate rocks are reacted with sulfuric acid to produce soluble phosphates, useful in fertilizers. This reaction is also used to make phosphoric acid, useful in soda. Potassium compounds are dissolved in sulfuric acid to produce potassium sulfate, useful in fertilizers. Ammonia is also reacted with sulfuric acid to produce ammonium sulfate. These three chemicals are solids and provide the three main minerals needed in plants. Lead acid batteries use sulfuric acid as their electrolyte. Sulfuric acid is very poisonous because of its acidity and corrosiveness. When it is mixed with sugar, it turns it into carbon. 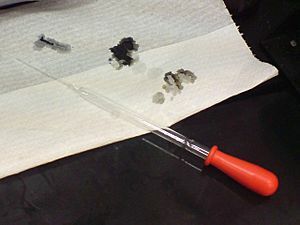 When it is dissolved in water, it becomes less harmful (does not make things black) but is still corrosive like normal acids. It reacts with metals to produce hydrogen and the metal sulfate. Some metals, such as tin, make sulfur dioxide and tin(II) sulfate. It reacts with sodium chloride to make hydrogen chloride. Superficial chemical burn caused by two 98% sulfuric acid splashes (forearm skin). 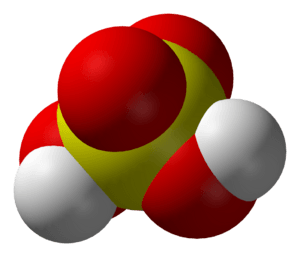 Sulfuric acid Facts for Kids. Kiddle Encyclopedia.